LOVE this BB cream! It applies so smoothly with an ultra-light feeling, especially since it has 50 SPF. 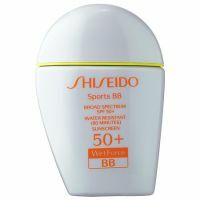 Always love Shiseido sunscreens and this one combines the best of both worlds! Perfect for those living an active lifestyle, want to protect and perfect their skin. After all day wear it looked a little splotchy, but once reblended with a tissue on-the-go it evened back out--the only sticking point I had about this product.